A recipient of the prestigious Diplomate status from the American Chiropractic Rehabilitation Board, Dr. Moreland devises a rehabilitation plan that is patient specific. Dr. Moreland is able to create high-tech rehab plans using equipment such as Wave vibration therapy for complicated injuries, or he can design low-tech rehab plans that patients can continue to perform at home after they are released from care. Rehab plans will be customized to fit your specific injury and your goals of care. Back In Motion Chiropractic offers a variety of rehabilitation equipment including physioballs, bands, tubing and weights to rockerboards, wobbleboards, and an iJoy balanceboard to a treadmill, exercise bikes and a vibration therapy platform. Conditions such as carpal tunnel and fibromyalgia require therapies that go a step beyond traditional chiropractic. These types of therapy can ease pain and inflammation and be a great compliment to Activator chiropractic adjustments. 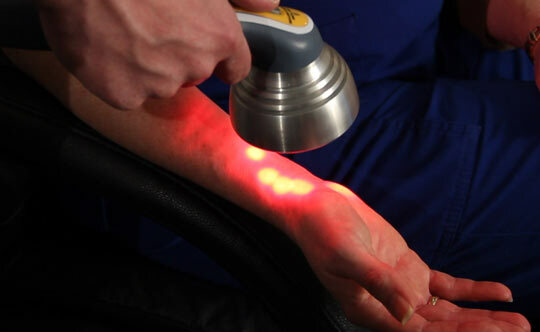 Low-level laser therapy (LLLT), or cold laser therapy, is a treatment that uses specific wavelengths of light (red and near infrared) to produce various therapeutic benefits like pain relief, increased blood flow and improved tissue healing. The lasers penetrate deeply (but safely) into the tissues and offer stimulation to the cells. Laser therapy has been found to be extremely effective for a variety of conditions including carpal tunnel syndrome, fibromyalgia and heel spurs. This non-surgical treatment delivers particles of energy to injured tissues allowing them to heal approximately 30-40% faster. Something else that really impresses me about Dr. Moreland is his commitment to getting his patients better. Most Chiropractors do not have his level of education in rehabilitation, but adding rehab leads to more permanent results. Another therapy is electrical muscle stimulation (EMS). EMS uses very mild electrical current stimulating muscles so they can be exercised. As with our laser therapy, there is no pain or discomfort involved, and the safety of our patients comes above all else. In the EMS procedure, electrode pads are placed over the muscle to be stimulated. An outside electrical source passes a very small current through the skin to the nerves, stimulating the muscle, much in the way your own body does naturally. Various levels can be selected to create different therapeutic effects. A third therapy offered at Back in Motion Chiropractic is intersegmental traction. Intersegmental traction uses a table with rollers that gently move up and down the spine. The table mobilizes the spinal column while stretching ligaments and muscles. Intersegmental traction helps re-establish the normal ranges of the body’s spine, facilitating muscle relaxation, reducing muscle spasms, and accelerating the recovery progress from a back injury. Furthermore, the table can increase blood flow and oxygen to muscles and ligaments. As a result, patients experience improvement in balance, strength and mobility. Wave® Vibration Therapy is a low impact therapy that helps strengthen muscles even when patients are in pain or have limited mobility. Vibration therapy was originally developed by the Russian space program and is used by Olympic and professional athletes. 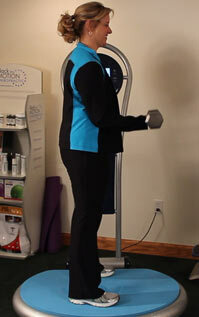 You simply stand, sit, or perform exercises on a platform that vibrates up and down. The movement is only a few millimeters up to 50 times per second. This gentle action stimulates a stretch reflex and involuntary muscle contractions. Involuntary muscle contractions help tone and build muscle effectively because more muscle fibers are engaged during involuntary muscle movement than during voluntary muscle movement. Wave whole body vibration therapy has been shown to increase balance, strength and mobility. Dr. Moreland has also expanded his services to assist those patients wanting to lose weight and improve their physique. Zerona laser therapy is clinically proven and approved by the FDA as a non-invasive body contouring treatment. There's no pain or recovery time needed. The cool Zerona laser targets fatty tissue, safely melting unwanted fat and allowing it to be passed from your tissue through your body’s normal detoxification process. For more information, visit our Zerona laser site. Dr. Moreland determines the appropriate therapy for each patient and creates a wellness plan. The use of therapy can eliminate pain and give immediate relief. He is skilled in administering these types of therapy with or without the use of the Activator (see our Activator page for more information). Isn’t it time you contacted Back in Motion Chiropractic at 724-537-5266?